Having worked in public services for over 15 years, Taiba has recently moved across the Pennines from Lancashire. Taiba’s first short screenplay in 2016 was longlisted for Create 50’s international film contest The Impact. 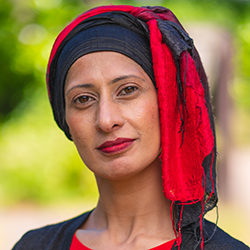 In 2017 Taiba was selected for New Writing North’s talent development programme Significant Ink. Driven by clichéd depictions, Taiba aims to reclaim the narrative with her writing.